in Single crochet, back loops. This cake yarn scarf is a pretty and easy to make scarf. It uses one ball, or cake, of Lion Brand’s Mandala yarn (DK weight). And it is all single crochet stitches in the back loops. 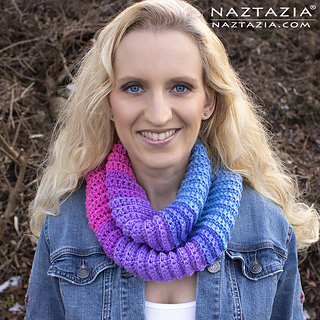 There is a tutorial video that shows step-by-step how to make this scarf. Also there are some tips and tricks for measuring, counting, checking gauge, sewing, and weaving in ends.